We offer two main types of service – One time or Purge[click] or read below for our scheduled service offers. We guarantee our prices! Generally, we just need to know how much paper your company produces a to determine the number of shredding consoles(consoles are pictured to the left) you will need. If you already have another shredding company servicing your business, you may already know how many shredding consoles you’ll need. 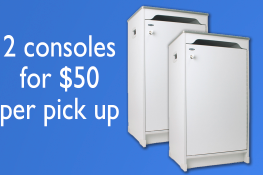 There is no charge for the console, we just charge for the service call(to empty the consoles). We charge $25.00 each time we empty each console. We have no added fees or fuel charges. The minimum number of consoles is 2, or $50 per service call(to empty the consoles.). Our consoles & shredding services are 100% compliant with all federal and state privacy legislation including HIPAA and FACTA. Our service area is Orange County, California. 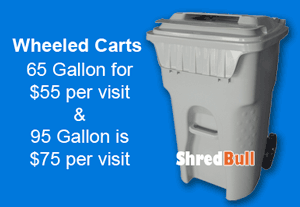 The locked wheeled shredding cart is also a popular choice. Our carts are 100% compliant with all federal and state privacy legislation including HIPAA and FACTA. These carts are very convenient as they hold a lot of material and can take up to 1/2 inch of paper at a time. We have no added fees or fuel charges, you just pay for the service fee each time we empty the cart. 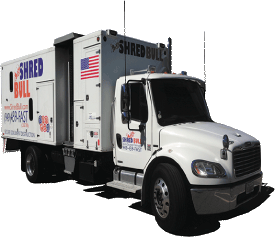 Our Awesome Shredding Truck Weighs in at 26,000 Pounds! Pricing is not the only consideration you have, but let’s face it, once you watch a big mobile shredding truck shred your documents you’ll understand how difficult/impossible it would be for anyone to put all those pieces of shredded paper back together. Our truck holds 10 tons of shredded material…that would make for a huge puzzle. Once we shred your documents, they never leave our control…ensuring a proper chain of custody. We are 100% compliant with all privacy legislation as well. Bottom line is, we are small and efficient allowing us to beat the big guys prices. 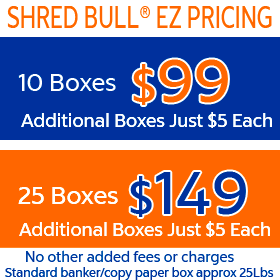 Here is our shredding services pricing, call us if you have any questions. Shred Bull Paper Shredding Truck arrives at your location. Shred Bull shredding staff gathers documents to be shredded. Documents are shredded at the customer’s location using our giant hammermill shredder. Client receives a certificate of destruction with their invoice. Shredded paper is securely transported to the paper recycling mill. The chain of custody is important, so the shredded paper never leaves our control until it is safely and securely recycled. Call us or text us anytime. If we are not at the office we still answer the phone, respond to questions and set up appointments, 7 days a week. If we are not at the office we still answer the phone, respond to questions and set up appointments, 7 days a week. We service accounts in the field Monday-Friday 7:00AM- 7:00PM and are open on Saturday and Sunday by appointment. Always best to call or text first before coming to our office so we can make sure we have the truck and operator ready to shred.